Intro: What is Main-Lining Cannabis? 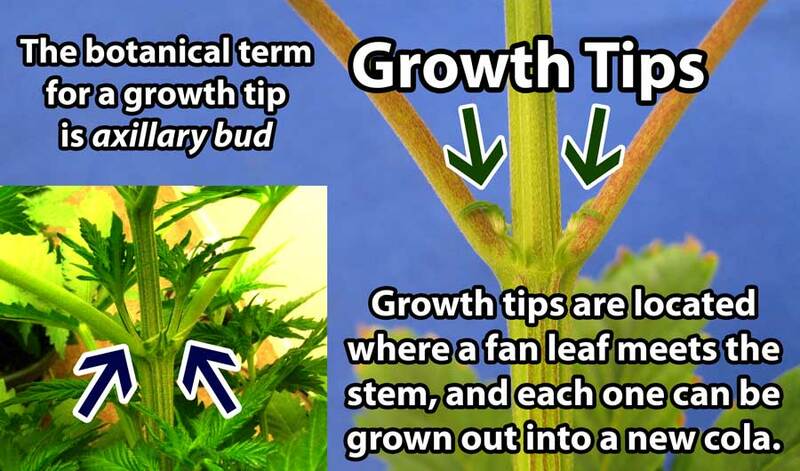 The cannabis “main-lining” technique is the process of building a “manifold” on a cannabis seedling to form bigger buds (and overall increase yields) in the flowering stage. It was originally described by a talented marijuana grower named Nugbuckets who gave it the name main-lining. Main-lining vs Manifolding – They are exactly the same thing, just two words for building a cannabis manifold. 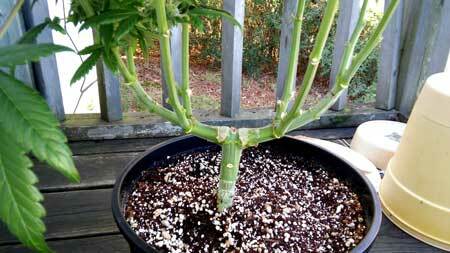 I call it manifolding, but many growers use the word “main-lining” since that is what Nugbuckets originally called this training technique. However, the term main-lining can mean something unsavory, so I personally choose to use the term “manifolding” when describing the technique of making a manifold. No matter what it’s called, we have been experimenting with his technique for growing cannabis indoors for a few years now. We have altered the original manifolding process by Nugbuckets slightly. This increases yields and saves time (gets to harvest sooner), but at its core the idea is the same. A cannabis “manifold” is simply a plant where the main stem was split evenly in two when the plant was young. There is nothing magical about this technique. It’s just a way to train the plant to grow, and it works well for simultaneously breaking apical dominance while creating many big colas/bud sites without much effort. 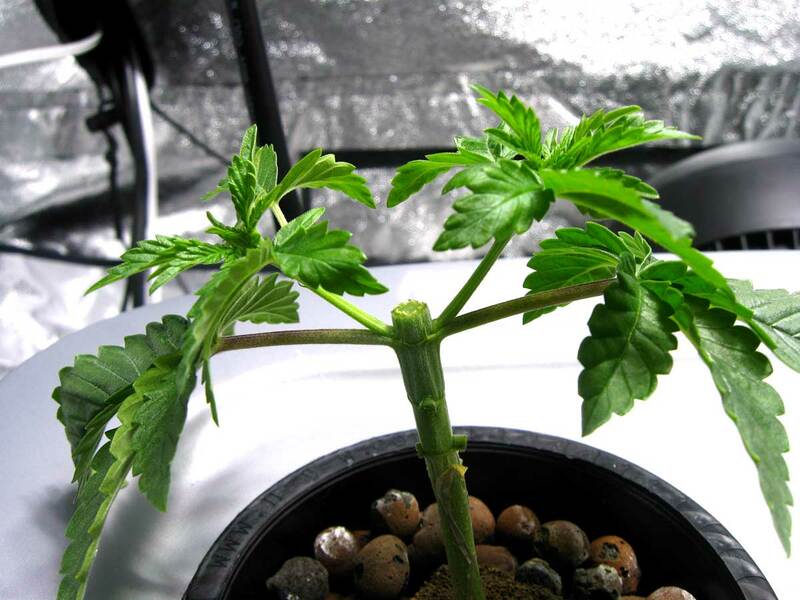 When the plant is split this way, it completely destroys the “apical dominance” or the tendency of the plant to focus mostly on its one main stem. With your plant’s apical dominance broken, it tends to make many long and thick buds sites (colas), instead of just one main one. After the base of the manifold has been created, the grower uses it to create several bud sites on each side. As the cannabis plant grows out, this structure creates several evenly sized main “colas” (or main stems where buds form). 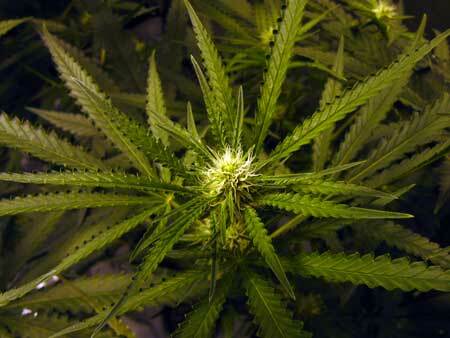 This is opposed to a naturally grown marijuana plant, which will usually produce just one main cola indoors. Indoors, the manifold technique can be used to dramatically increase your yields by giving you a “canopy” of fat buds. 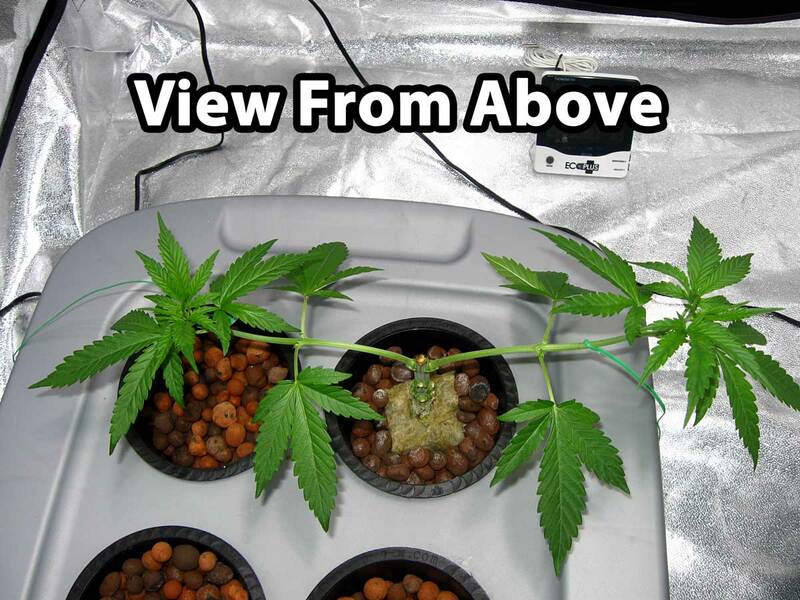 Below you can see the same two plants with a cannabis manifold grown out – there are many huge buds under the grow lights instead of just one or two like with a standard cannabis plant. In the Nebula manifold method we keep ALL the colas that will produce big buds! Unlike with Nugbuckets’ original method, we keep all the big bud sites (“colas”) that reach the top of the plant. This results in bigger overall yields than just keeping the original 8 colas recommended by Nugbuckets. The Nebula manifold method also saves you 1-2 weeks of training in the vegetative stage compared to the original technique, so you get to harvest sooner! Because of the shorter training process, these plants made it to harvest just 4 months from seed, yielding about 11 ounces in total! Does manifolding work on short plants? Since the Nebula manifold saves you an extra week or two in the vegetative stage, it is more suitable for shorter plants than the original Nugbuckets main-lining method. If you follow the instructions in this tutorial, a cannabis plant can be effectively manifolded as long as it has room to grow at least 2 feet tall. 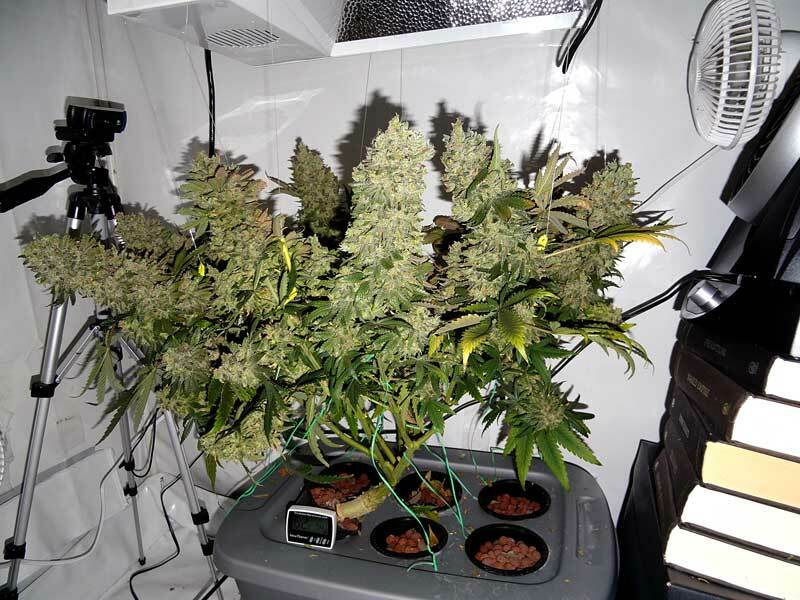 For example, the below plant was trained according to this tutorial and was able to harvest over 6 ounces on a single 2 foot tall plant! Manifolding needs to create long colas to be effective, and very short plants can’t do that. If the final plant is shorter than 2 feet, the manifold technique won’t be as good at increasing yields since you’re not playing on its strengths. Along the same lines, a manifolded plant also needs to be grown under a powerful grow light like MH/HPS bulbs or an LED grow light with 3W or greater sized chips. More powerful lights means that the buds will get filled out all the way down, instead of just at the tops. Because of that, unfortunately manifolding doesn’t work well for growing short plants growing under fluorescent or CFL grow lights, but that’s what topping and/or fimming are made for! This manifold tutorial gives you step-by-step instructions on the process of manifolding cannabis the Nebula way to get more buds and bigger yields! If you follow the steps and instructions exactly as written, it’s almost impossible to mess up! Think of it like a recipe, but it’s a recipe for plant training! 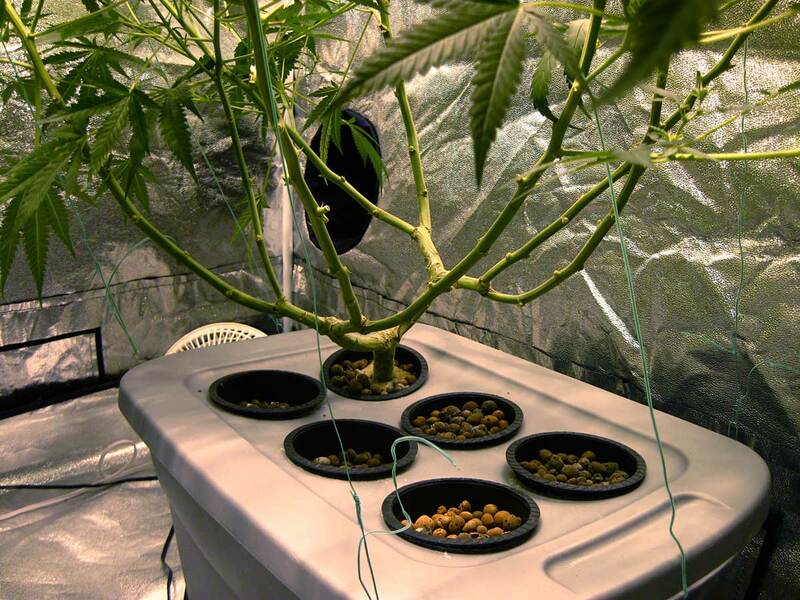 Why build a manifold when growing cannabis indoors? Bigger Yields! The main reason I use main-lining to build a cannabis manifold is because this training technique results in big yields from any indoor grow setup. By building a manifold in the early vegetative stage, you can get an extra 40% or more yields compared to not training your plants. I’ve used several other types of cannabis plant training techniques, and I believe main-lining cannabis is the most straightforward way to get great results every time. It takes the best elements of all the other techniques, and combines them into one step-by-step process that’s hard to mess up if you follow the instructions. No more guesswork! Easier Than Other Training Methods – Because you can follow each step word-for-word, without having to make any judgment calls of your own, it’s difficult to mess up! In this manifold tutorial, the basic idea of main-lining cannabis is to simply cut the plant a few times in a certain way, over the course of a few weeks. Then you just arrange the buds where you want using twisty tie. 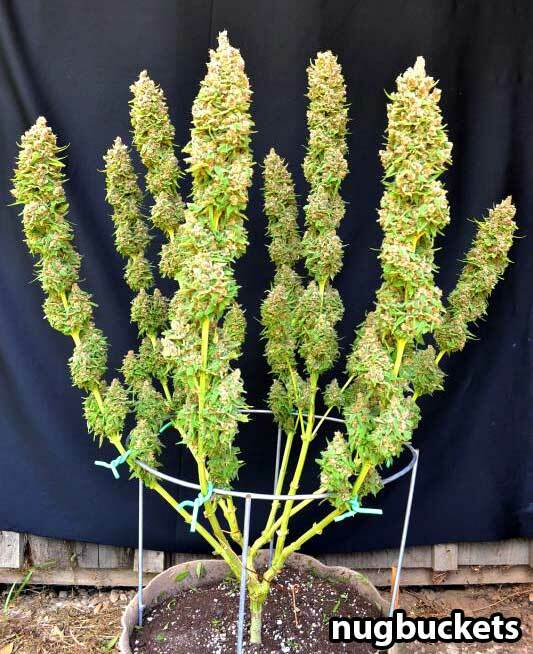 Each of the colas tends to grow about the same height as each other, which makes it straightforward to get a “sea of colas” that are each thick and dense, without a lot of popcorn or larfy buds. There’s nothing you have to do to make this technique work for you, or customize it to your setup. 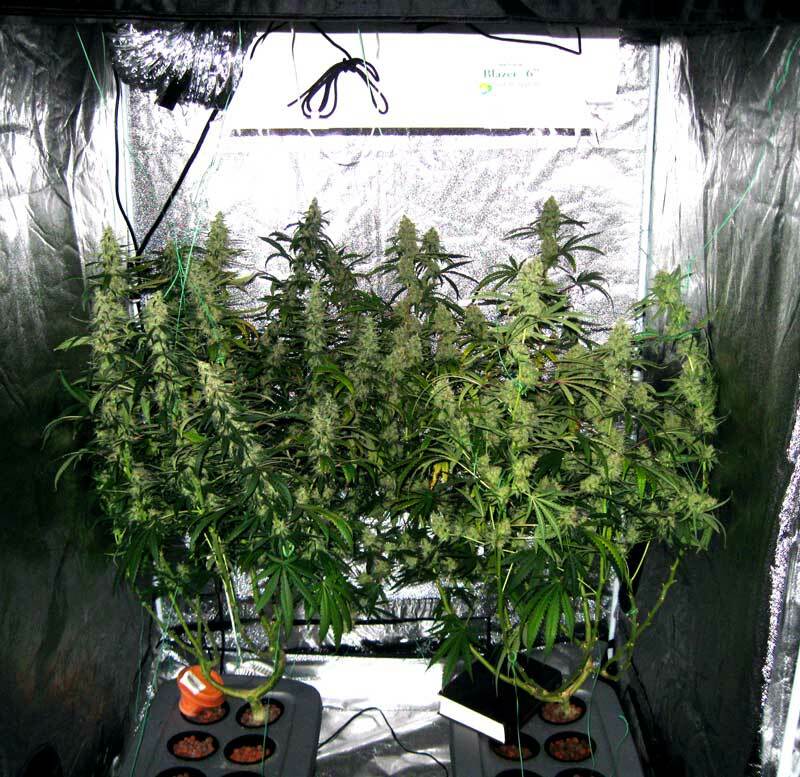 Less Time Spent Training – Since you just top the plant a few times and place buds, it really doesn’t take much time to get plants to become a desirable shape with lots of colas indoors. Some training methods can create similar shapes and canopies, such as ScrOG (using a net), but training plants to weave through a net can take up to an hour a night during the intense process of filling the net in the late vegetative stage. 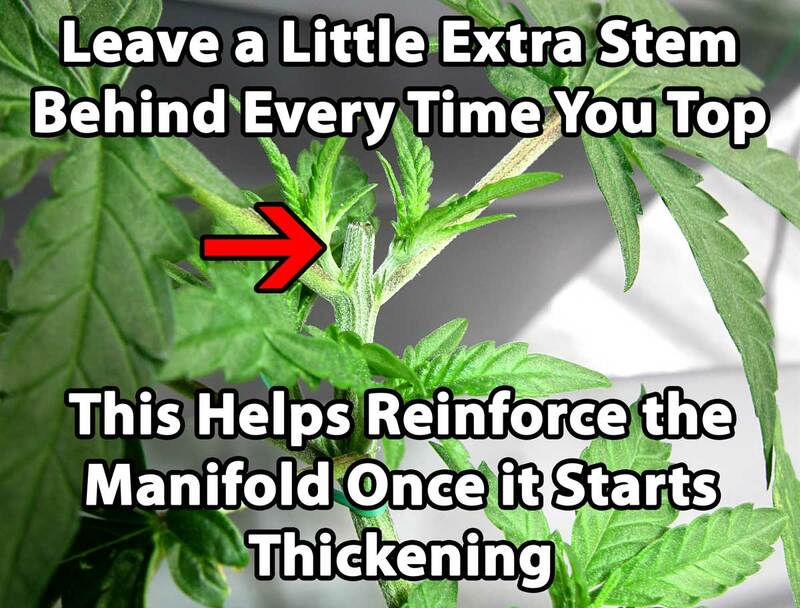 Conversely, manifolding only takes a few minutes for the first few weeks of veg, then basically no more training is needed besides holding up heavy colas late in the flowering stage. Training is Over Early in the Plant’s Life – Since all the training happens in the first few weeks of the plant’s life, you’re pretty much done with training early on. Once I’ve finished my manifold, I know I’m past the “hard part” of training, and can spend the rest of my time focusing on caring for my plants, instead of getting frustrated about trying to control their shape. Less Likely to Get Bud Rot or Mold – Manifolding cannabis builds a support structure for many colas that are thick and uniform, with less chance of getting bud rot or other types of mold. When a cannabis plant grows naturally with one main cola, under very powerful grow lights the cola can get too thick and increase the risk of developing bud rot (when the inside of the buds simply start rotting away), or developing mold during the drying and curing process. 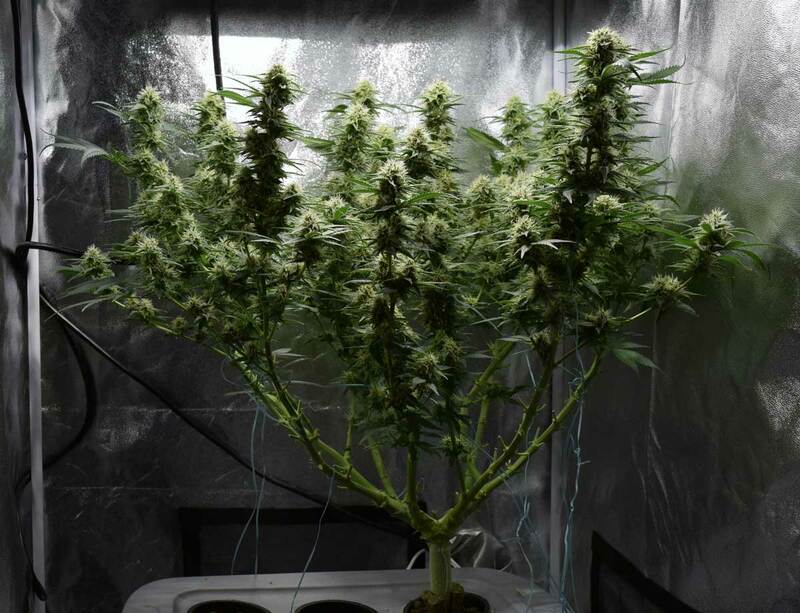 While the manifolding method produces many big thick colas, the plant spreads the energy more evenly between them so none of the colas will get to the point where the grower simply can’t maintain them properly. 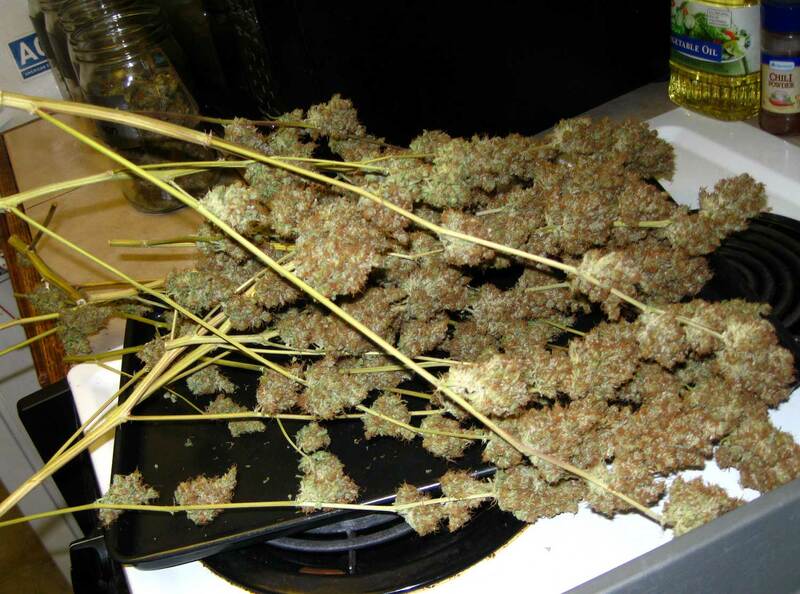 Buds Dry More Evenly – Since all the buds are a similar width and density, drying is a lot more straightforward. 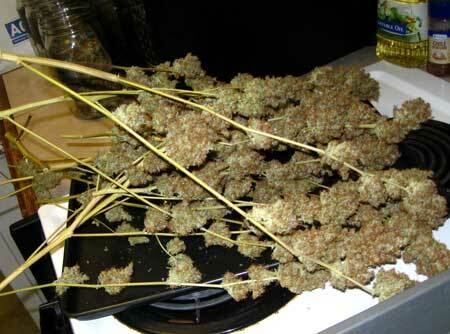 All the buds tend to be done drying at the same time. 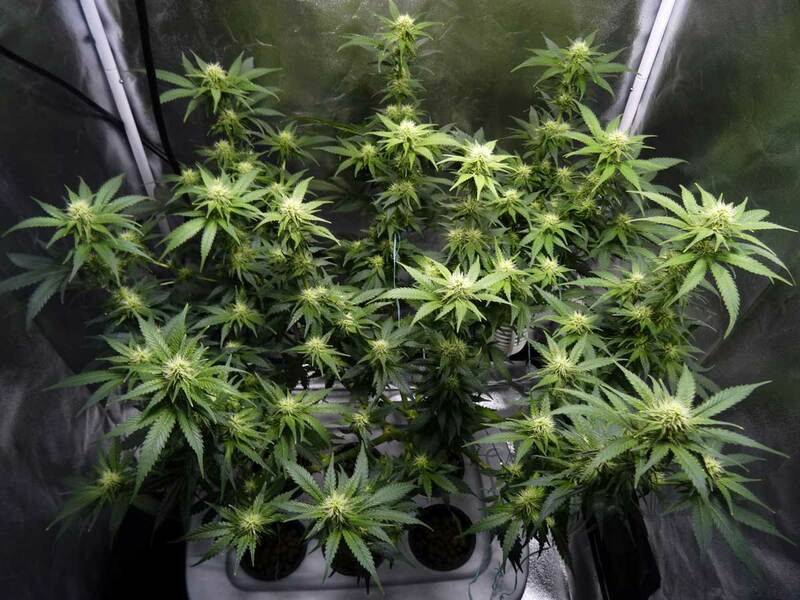 Improved Appearance – While big and small buds are pretty much the same when it comes to potency, many growers prefer the appearance of large dense buds, which is what you’ll produce on a manifolded plant. What’s the Difference Between the “Old” Way and the “New” Way? In the original technique, each main stem is the same number of “steps” from the base of the plant, which helps the plant deliver resources more easily. But in order to achieve this perfectly symmetrical shape a grower needs to cut and prune the plant 3 times, waiting a week or more in between each pruning session. 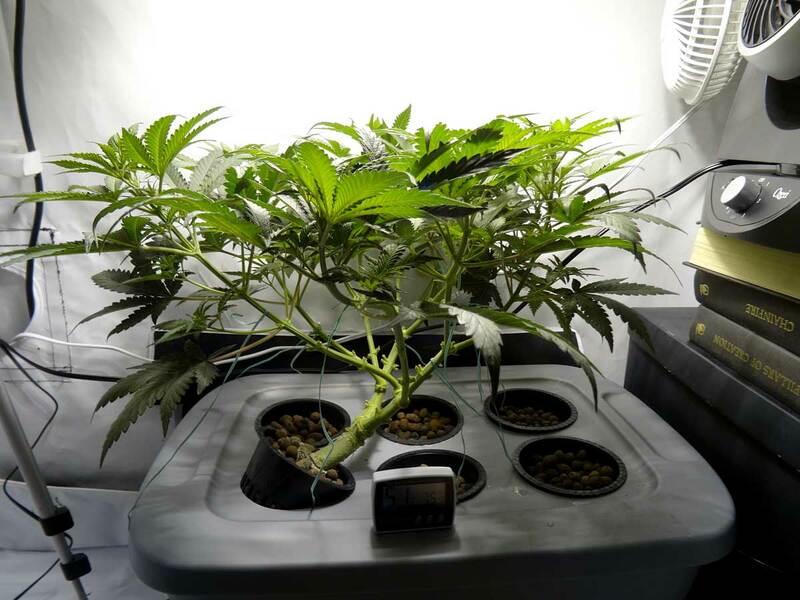 That can add several weeks onto the cannabis vegetative stage because each time you prune, you’re losing a lot of the growth built up by your plant. 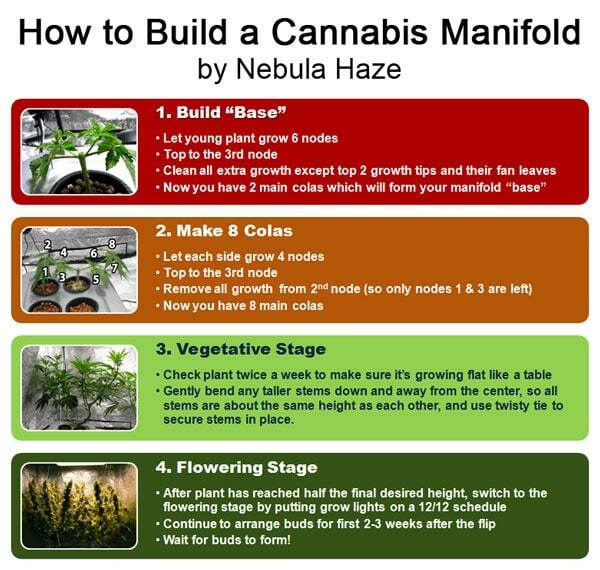 Or… You can skip all that wasted time and build a marijuana manifold the way Nebula does it in this manifold tutorial! The Nebula manifold doesn’t look quite as even and symmetrical, but will get you identical results in less time, with less wasted growth! This process is not fundamentally different in any way; it is basically the same principle but modified slightly for improved results! In our experiments the results are the same with a “modified” manifold, but you save time! Even when the plant isn’t centered, the Nebula manifold technique works perfectly, it works great in most setups and with just about any plant! No Auto-Flowering Strains – You cannot manifold auto-flowering plants, which should be allowed to grow naturally. 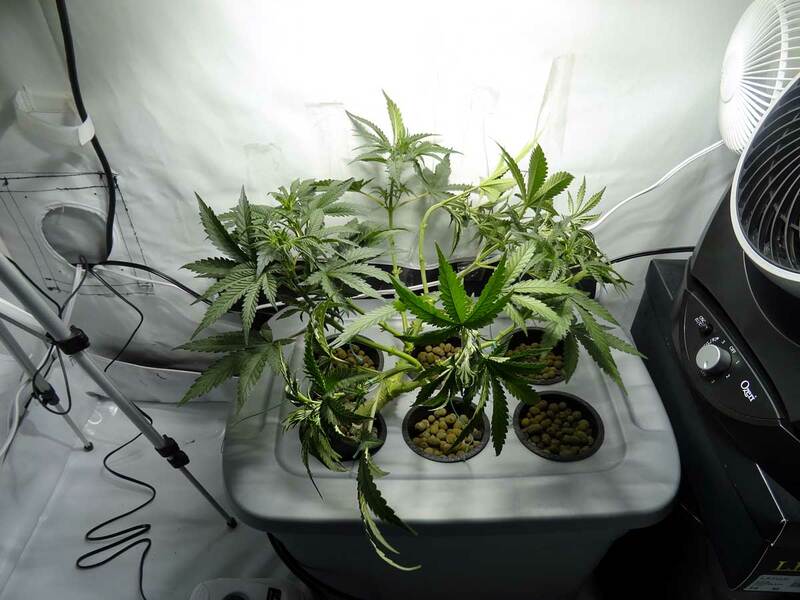 You Need Powerful Grow Lights (an MH/HPS bulb, or LED grow lights with at least 3W chips) – Manifolding doesn’t work well for increasing yields on plants under small grow lights with poor penetration, like fluorescent lights or CFLs. Plants grown under these lights won’t get good results with manifolding, and may even hurt their yields! 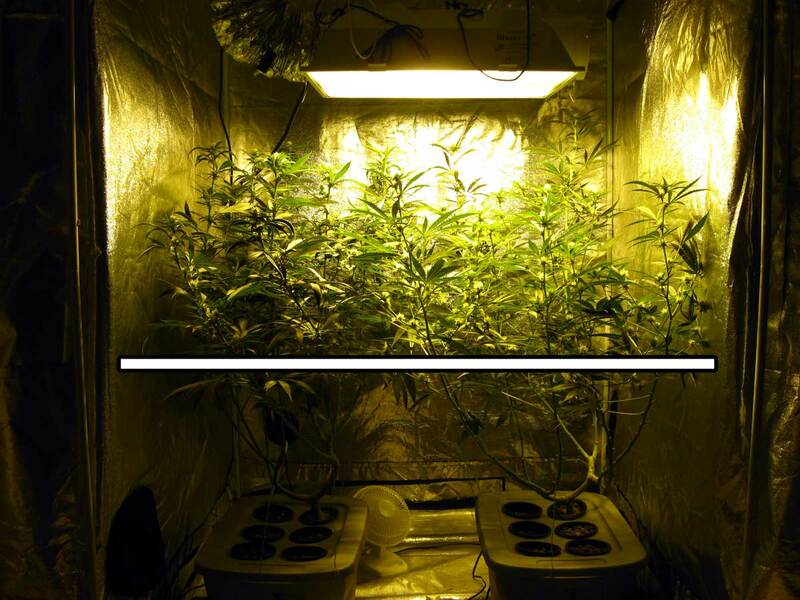 In order to manifold cannabis effectively, you should have at least a 150W MH/HPS grow light or bigger, or powerful LED grow lights with at least 3W chips. Smaller lights just won’t have the penetration to take advantage of the manifolding structure. 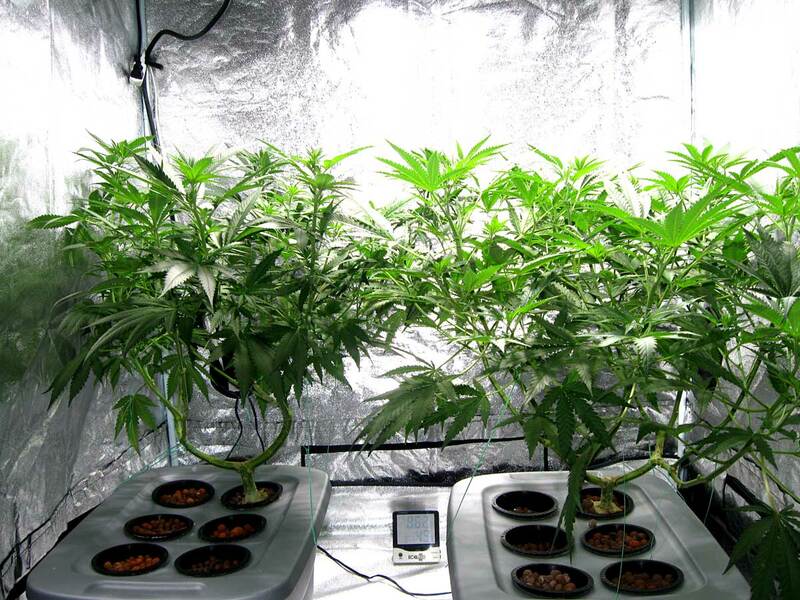 For smaller lights, standard topping or FIMing will get you nearly identical results in less time! Plant is Able to Grow At Least 2 Feet Tall – Manifolded plants need to be allowed to grow to at least two feet tall for the best results, since manifolding makes long dense colas! If you don’t have that much height available in your grow space, you might consider topping or FIMing your plants in stead, since these techniques are perfectly suited to short grow spaces. Plant Must Already Be Healthy and Growing Fast Before You Start – Never start main-lining a cannabis plant that isn’t already healthy and growing fast. For an unhealthy plant, the main-lining process will slow growth even more and may stunt the plant. Nebula’s “modified” manifold technique saves an extra step (saving you 1-2 weeks of growth in the vegetative stage) compared to the manifold technique by Nugbuckets, and in our experiments the results are identical! This is what main-lining and building a manifold can do for you! This technique of building a manifold at the base of cannabis plants has been adopted by many marijuana growers in dozens of different grow setups, and it’s not always done the same way. The following steps do not describe the process exactly how Nugbuckets does it, but I’ve had identical results with main-lining cannabis this way and it saves time compared to his original steps. 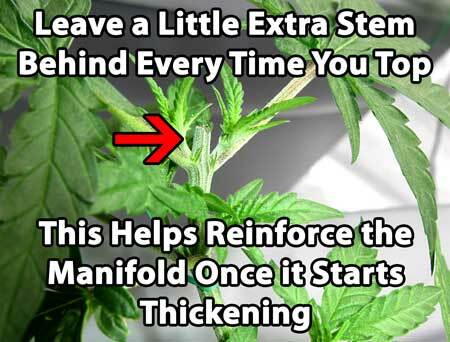 Many growers have asked me for a quick, concise manifolding tutorial, so here it is! This is the super condensed version for main-lining cannabis indoors, exactly as I do it now (after some trial and error). The complete tutorial with pictures and notes is below! Plant yo-yos (or “yoyo supports”) – although you won’t need these to start, you’re probably going to need these to hold up all your tall, heavy colas when they start falling over from their own weight in the flowering stage! Plant ties are made of thin wire with a plastic coating on the outside. They tend to be more flimsy and don’t have a lot of strength. They are very gentle on young plants. 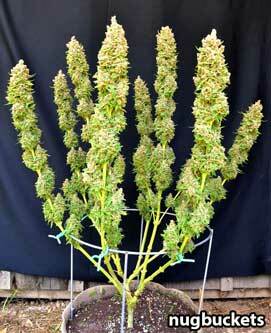 In the flowering stage it’s common for your buds to start falling over from their own weight. Plant yo-yos can be hung conveniently to the top of your grow tent or grow space, and the special hooks at the bottom are idea to hold onto thick colas without causing any damage to your buds. Now you have 8 colas! In addition to regular plant care, specifically check plants at least twice a week to make sure everything is growing flat like a table. Older stems start getting hard and woody and are more difficult to train, so if you check plants at least twice a week you’ll be able to bend stems while they’re still young and flexible. Getting used to checking on your plants regularly is a great habit that will serve you well in your cannabis growing adventures! Try to fill every “space” under the grow light with colas that are a few inches away from each other, and all the same height. 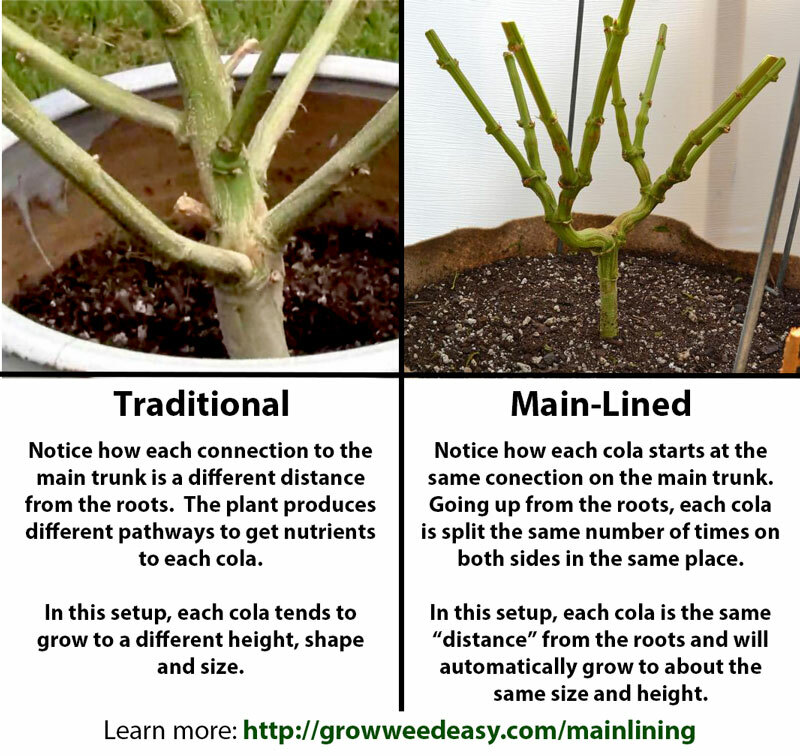 If at any point you can see a cola is growing taller than the others, gently bend it down and away from other colas. Use twisty tie to secure stems so everything stays in place, otherwise your stems will turn back up overnight! Keeping up with this process throughout the vegetative stage gives you a flat, even canopy with many evenly spaced bud sites. 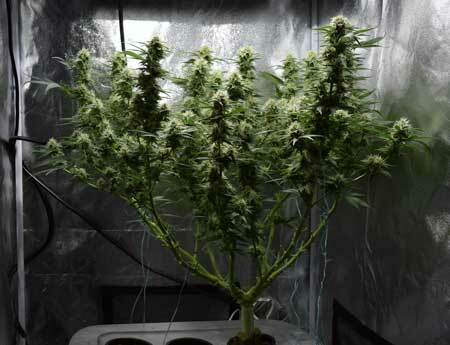 Switch to the flowering stage when the plant has reached half the final desired height. 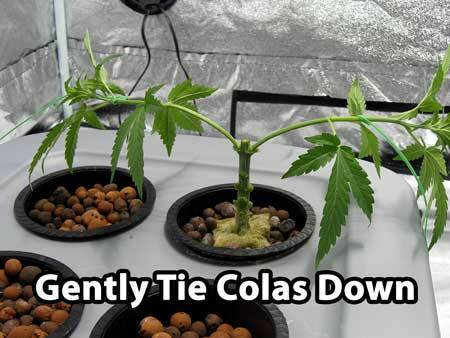 Continue to arrange colas to fill up your space under the light for first 2-3 weeks after the flip to 12/12. If any colas are growing much taller than the others, make sure to bend them down and away during the first few weeks, securing them just like before. This is especially important for colas growing directly under the grow light since they are most likely to grow too close to the light and get burned! Now you just wait for big fat colas to form under your grow lights! 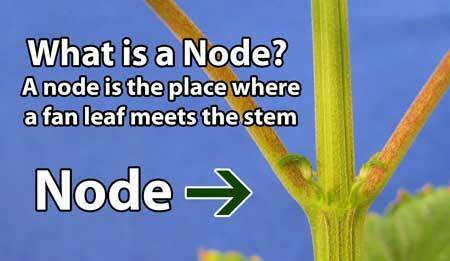 Node – A node is the place where a fan leaf attaches to the stem. With seedlings it’s almost always a pair of leaves, though with clones it you may see just one leaf at the node. 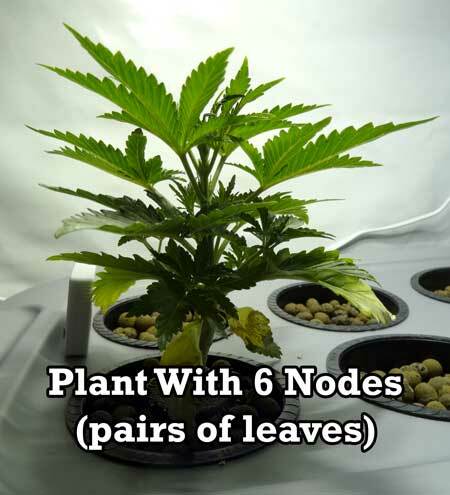 In this manifold tutorial we’re only dealing with seedlings, so when talking about the “3rd node” for example, it means the 3rd pair of leaves from the base. A fan leaf has serrated edges, so don’t count the first two round cotyledon leaves when counting nodes. Cola – sometimes called a “top” a cola is basically a stem with VIP status. Essentially, a cola is a main stem with a growth tip that has reached the top of the plant. 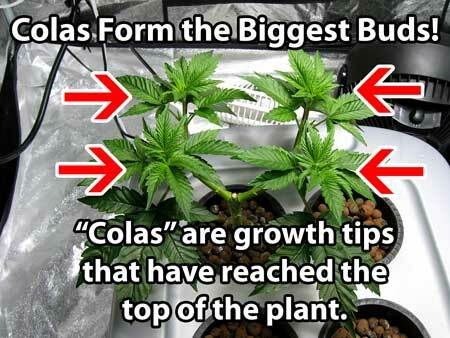 The reason they get a special name is because in the flowering stage, it’s the colas that grow the biggest buds. 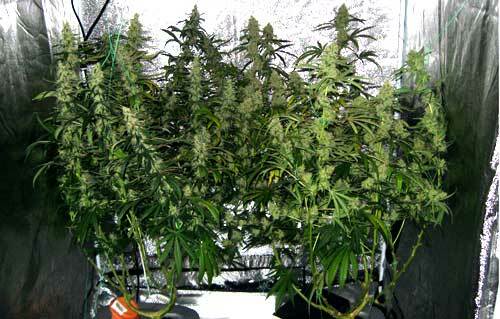 The goal of main-lining is to end up with many evenly spaced colas on your plant, so you get to harvest many big buds! 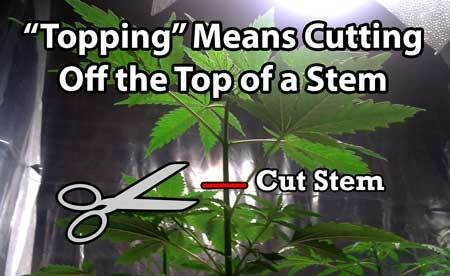 Topping – To “top” a cannabis plant means to cut off a growth tip. You can cut near the end of a stem, or further down. 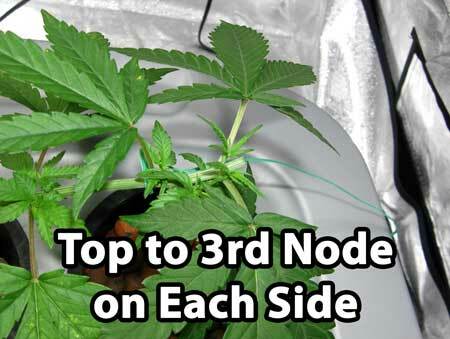 In this article, you top plants right above certain nodes. Wait until your plant has grown 5-6 nodes, looks healthy, and is growing vigorously. Why wait? If you start main-lining too early, you can stunt growth and your plant might take longer to recover through the whole process. 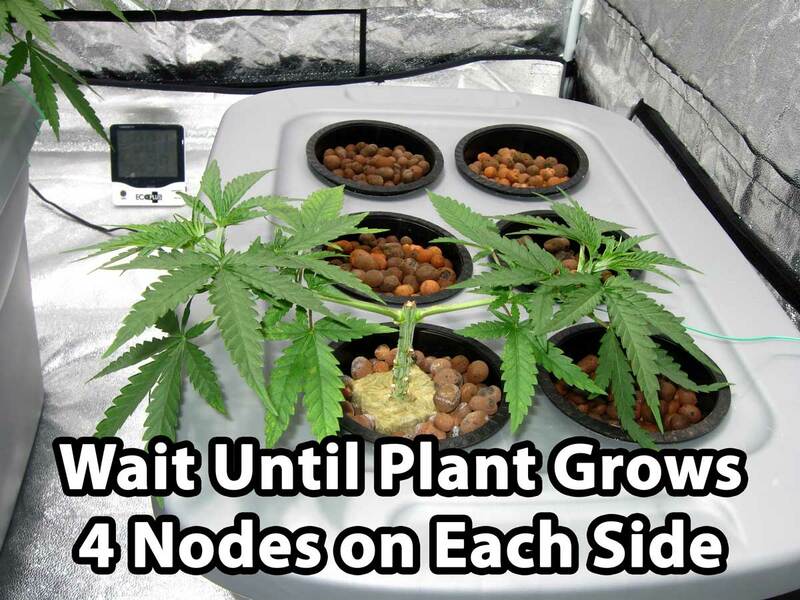 A plant that has 6 nodes recovers incredibly quickly from topping, while a plant with less nodes than that can be stunted for weeks from a single topping. Although it’s optimal to start the manifolding cannabis process when the plant has 5-6 nodes, it’s possible to start a little later. However, the later you start the more time you’ll have wasted in the vegetative stage (and wasted time means wasted money), so you don’t want to start late if you can! Top down to the 3rd node and clean extra growth below it. 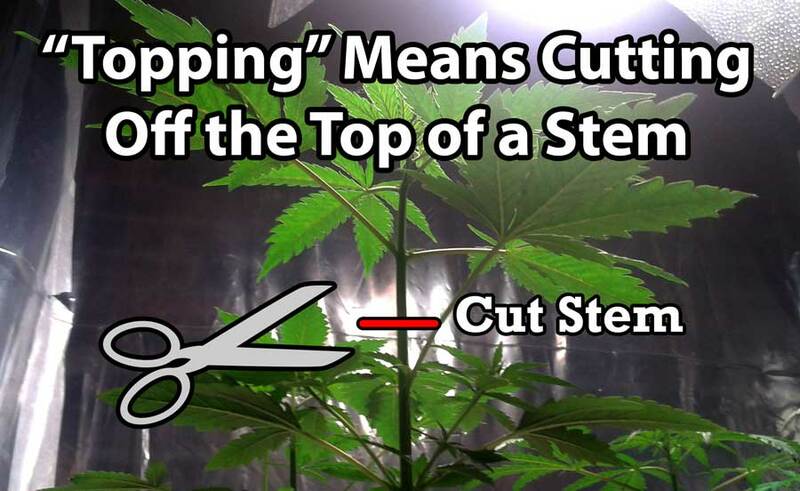 Basically you’re just cutting off the tip of the plant, right above the 3rd pair of real (serrated) leaves. After cutting to the 3rd node, clean off all the vegetation below it. At this point, you only have 2 main stems ! You now have created the “base” of your manifold! This plant was topped to the 3rd node, and all the extra growth was cut away. The two growth tips on the 3rd node and the adjoining leaves are the only thing that was left. In this step we’re going to wait until the new tops/colas have recovered and look like they’re growing fast. Once each side has grown 4 sets of leaves, you’re ready to go to the next step. In this step we’re going to wait until the new tops/colas have recovered and look like they’re growing fast. Then we’ll top all the new colas to the 3rd node again. 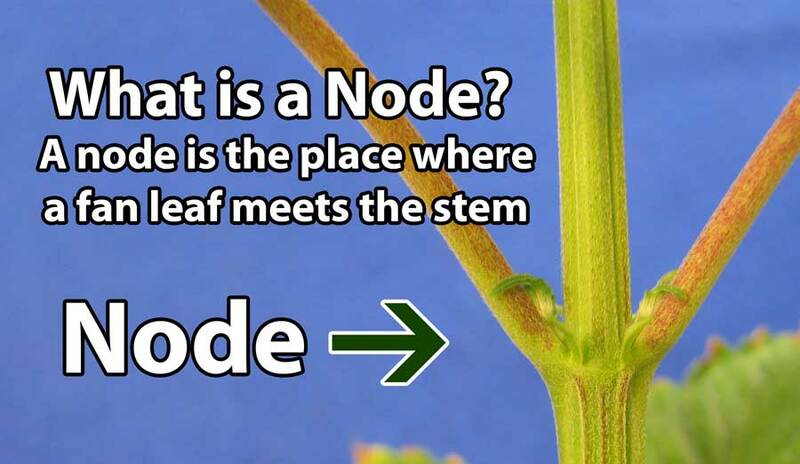 This time instead of cleaning the whole stem below, we will only remove the growth from the 2nd node. 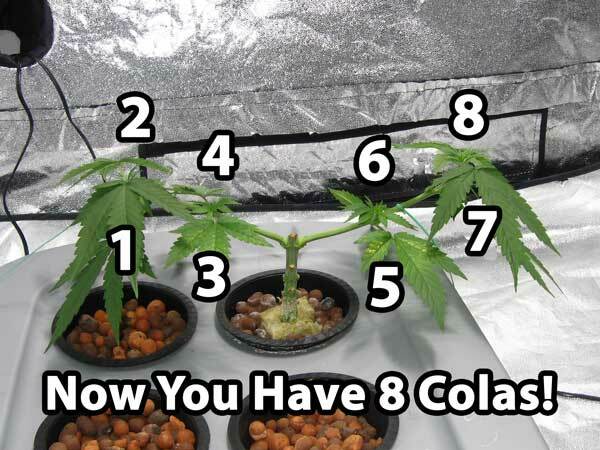 This leaves you with the 1st and 3rd node on each side so after this step you will have 8 main colas. 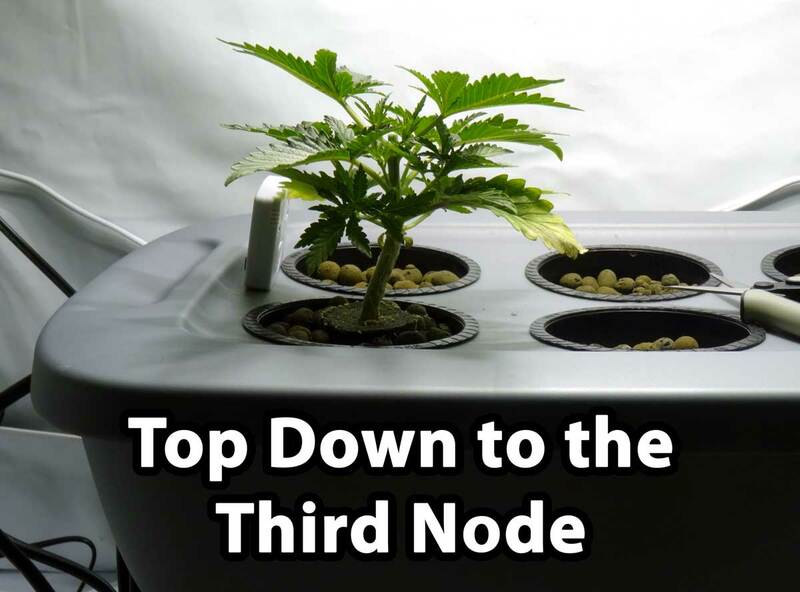 I think most indoor growers will be happy with 8 colas and the offshoots that grow from them, but if you do want more colas, keep the 2nd node in this step, or continue to top plants and repeat the steps again. For most growers, you want to follow the tutorial exactly, so let’s walk through this together! Top to the 3rd node on each side (remove tip above 3rd pair of leaves). 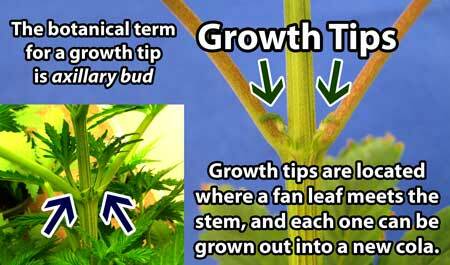 Be careful to avoid damaging the growth tips while topping the plant! There are now 3 nodes on each “branch.” Instead of cleaning everything like the first time, you want to remove the 2nd node on each side, leaving just the 1st and 3rd nodes. You’re almost done! Now you have just the 1st and 3rd nodes left. 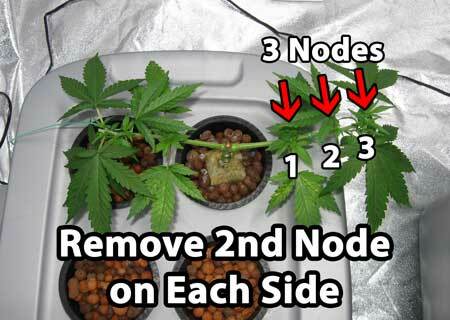 This leaves 4 total nodes on the plant, or 8 total growth tips/tops/colas! As your manifolded cannabis plant is growing in the vegetative stage, watch to make sure your canopy is staying flat, like a table. Check on plants at least twice a week; it’s really easy to train your plants if you’re checking on them regularly (takes just seconds) but it can be frustrating to try to train plants after their stems have already become hard and woody. Whenever your checking your plants, if any stems appear taller than the others, gently bend it down and away from the center of the plant. Use twisty tie to secure stems in place so everything stays the same height. Keeping up with this process throughout the vegetative stage gives you a flat, even canopy with many bud sites. The goal is to arrange most colas around the edges of the plant, with a few colas in the middle so it makes a flat table. Not long before the switch to flowering! Note: To avoid a hydro plant tipping in the net pot like in the above pics (which doesn’t really affect anything as far as growing but doesn’t look pretty), make sure the base of your manifold goes parallel with the length of your tub, instead of perpendicular like the above plant. 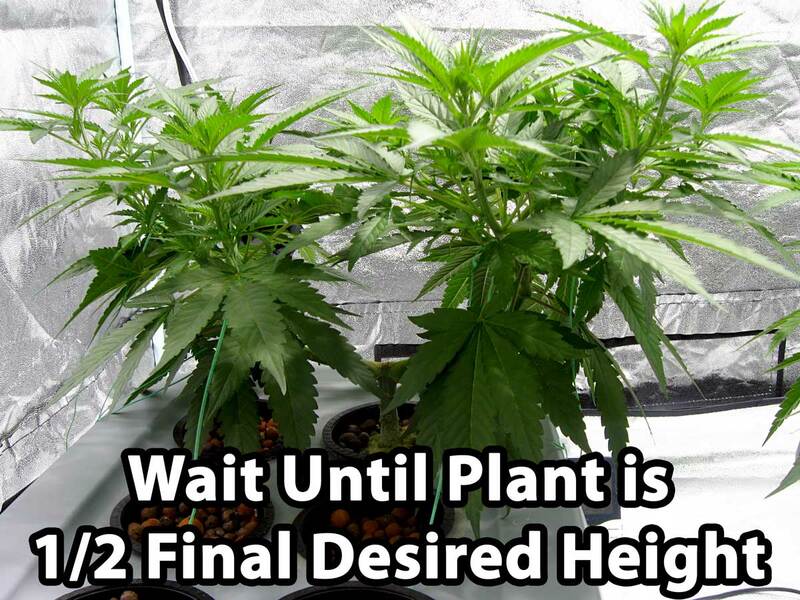 Once your plant has reached half the final desired height , it’s time to initiate the flowering/budding stage. You do this by switching the lights to a 12/12 schedule (12 hours light, 12 hours dark each day). 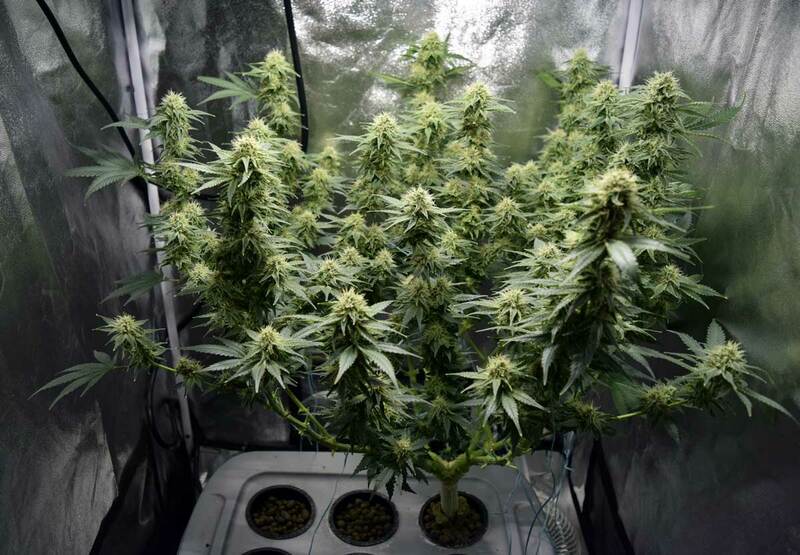 Your plant may double in height during the first 2-3 weeks of the flowering stage (known as the flowering stretch) so it’s important to flip to flower while you still have plenty of room left! 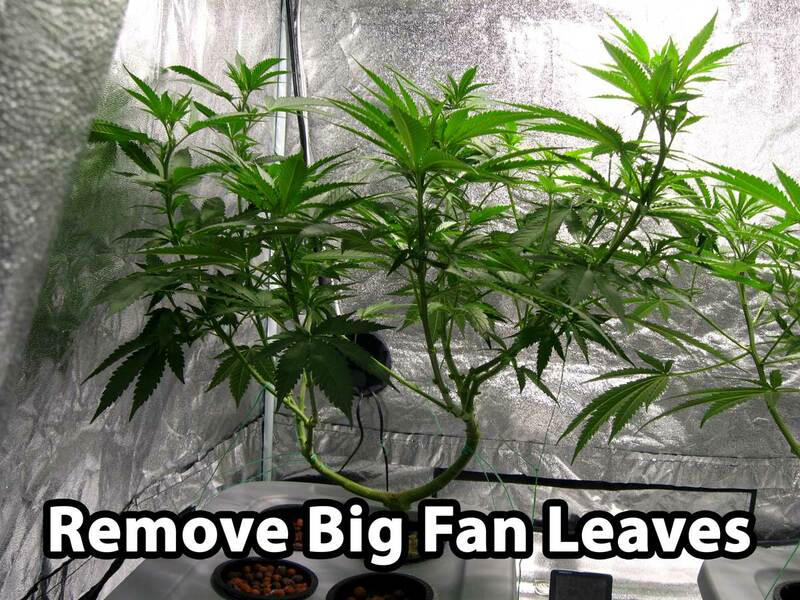 Right before the switch to flowering, give your plant a minimal last cleanup by taking off the big fan leaves, especially in the middle and bottom of the plant. 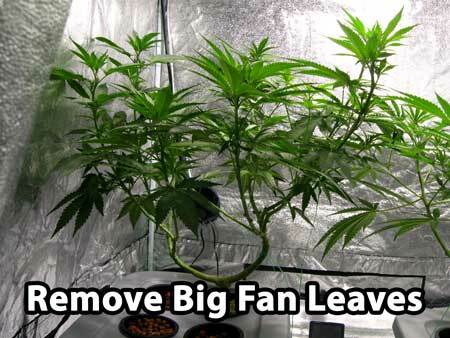 You also want to tuck or remove any really large fan leaves blocking bud sites. Be careful not to damage any growth tips at the base of each leaf. How many leaves to take off? When in doubt, take less leaves than you think you should since you can always come back later! 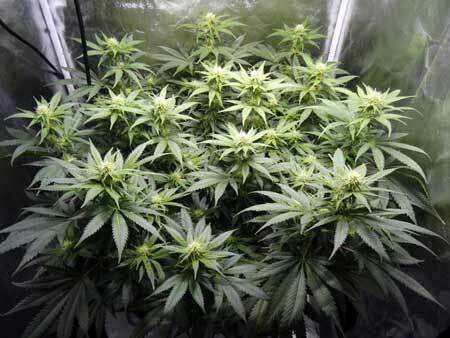 The manifold you created will power the growth of each of your colas through the first few weeks of flowering. 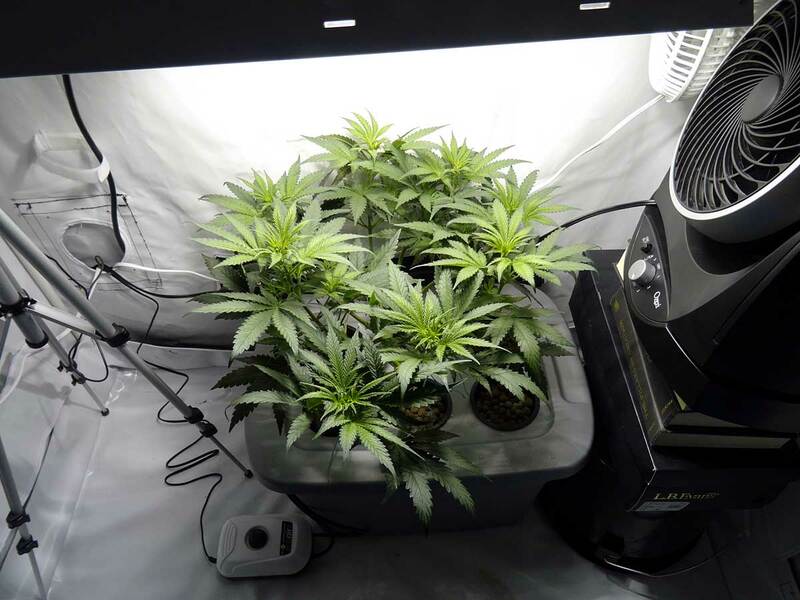 If the plant is getting bushy, defoliate the plant again around week 3 by removing the bigger fan leaves, and all the lower stuff that’s in major shadow. In general, if you’re unsure defoliate lightly during the flowering stage since you can always take more away but you can’t put leaves back. The plant will stop making new leaves altogether around week 5-6 after the switch to 12/12. If plant is bushy 3 weeks after switch to 12/12, after buds have started forming, you may want to do another defoliation session by removing most of the biggest fan leaves. Any buds in shadow won’t fatten up properly, so make sure to keep the lower part of the plant clean so all energy is focused on the top main buds. Remove everything near the bottom of the plant that will never make it to the top canopy, including leaves and “suckers” (small stems and growth tips). Plants will slow down in vegetative growth around week 3 or 4 into the flowering stage, and by week 6 they will have stopped growing new leaves altogether, and just be focusing on fattening buds. You need to make sure to leave enough healthy leaves to last until harvest time! As the flowering stage progresses, you may still prune away any small growth underneath that doesn’t get light, as well as big fan leaves that block bud sites and can’t be tucked away. Although defoliation (removing leaves) helps with better light penetration on bushy plants in the flowering stage, it’s important to remember that you can always take more but you can’t put leaves back. After 5-6 weeks of 12/12 your plant won’t really grow any more leaves at all! Notice how the bottom of the plant has been cleared of leaves, and most big fan leaves have been removed. How much of the plant do you keep clean? 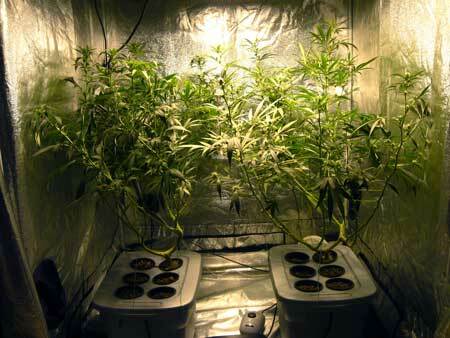 All big fan leaves should be removed, but how long you leave each cola depends on the side of your grow light. 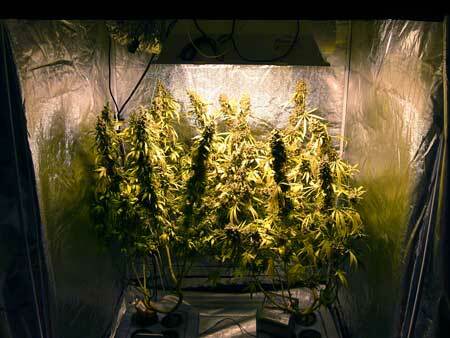 Bigger grow lights can support longer colas. You want to remove the parts of the plant that will never get access to light, but leave the parts that can take advantage of all the light that does make it down into the plant. The above plant is under a 250W HPS, which can’t “reach” as far down into the plant as a bigger light. The colas are only about 12″ long because everything below that point was removed because it was in shadow. The two plants below are under a 600W, which means that more was left on each cola. The parts of the plant that were in shadow were all removed but they’re still almost 2 feet long. 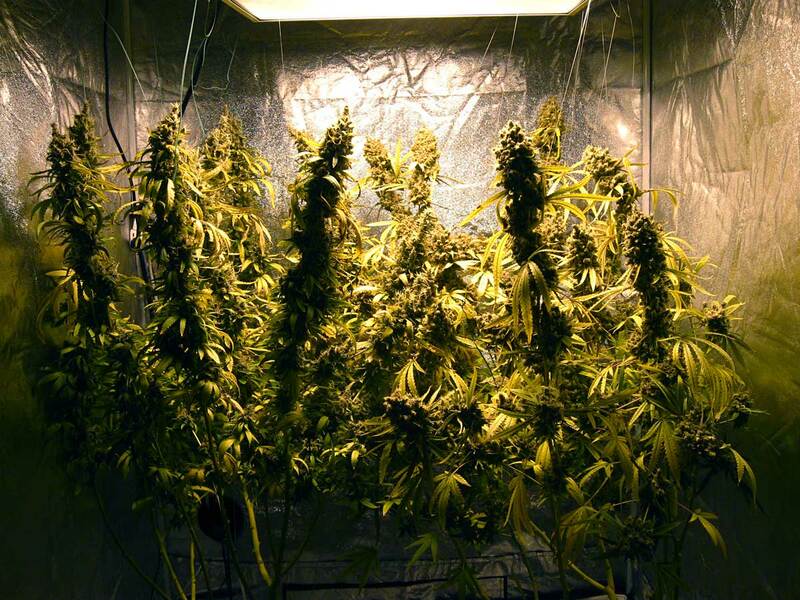 The 600W light reaches that far into the plant so these buds will fatten up all the way down. No more major defoliation after 3-4 weeks into 12/12. 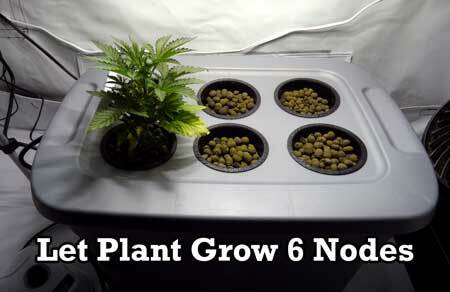 Plant growth slows down at this point and the plant will stop making leaves altogether by Week 6! You need enough leaves to make it to harvest. With your well-maintained plant under a nice grow light, you will be rewarded with long, dense thick colas with huge nuggets of buds!. You also get some very chunky buds wherever side stems are exposed to light and air. 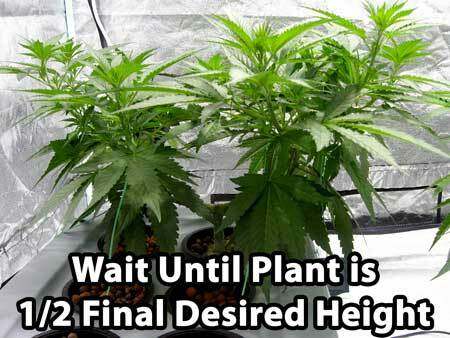 It’s a good idea to think about strains if you’re going to be growing more than one plant at a time. It helps to choose strains that are well-matched when main-lining. Main-lining doesn’t change the nature of the strain and it can be a pain in the bugg if you mix a strain that stays short with a strain that tends to grow tall. 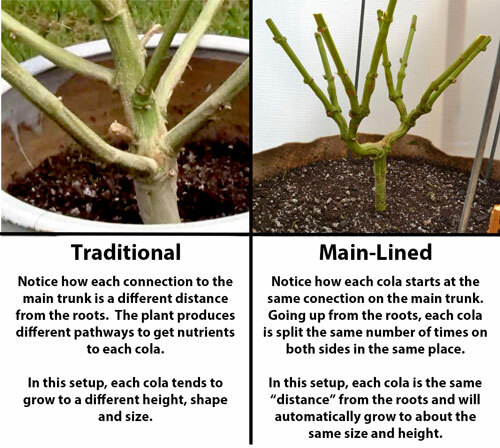 If you have a strain that tends to stay short, main-lining will help spread out the plant, but it won’t cause the plant to grow the long colas if the strain doesn’t tend to make long colas. Main-lined cannabis plants will grow with the same patterns as normal, just with a manifold. 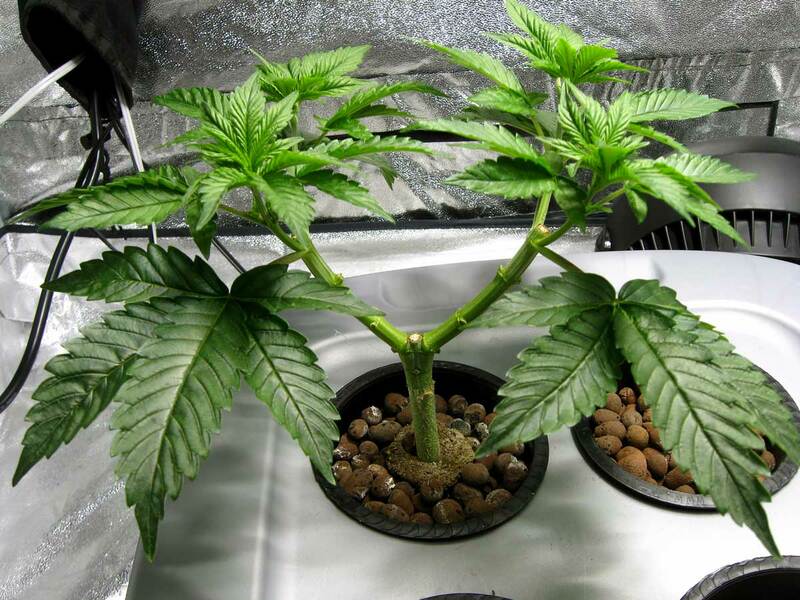 Main-lining won’t force a plant to stay short or grow tall, that’s up to you by choosing well-matched strains and keeping up with training/bending your plants. 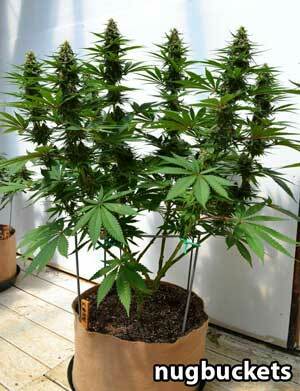 Indoors it seems the best benefits from main-lining come from growing strains that are considered “medium” or “tall” in height. These plants will have a bigger “flowering stretch” and may double or even triple in height after the switch to the flowering stage. This stretch is what creates the long colas of a main-lined plant. With a short plant that doesn’t have much of a flowering stretch, you aren’t going to get those long colas, and may not going to get the most from main-lining, especially compared to the time put in during the vegetative stage building the manifold. For shorter strains, or when growing short plants, other types of plant training like FIMing or Topping might be better at increasing yields, and will take less vegetative time. The main-lining cannabis process is much simpler with plants grown from seed since they usually have symmetrical nodes unlike clone. If you decide to start main-lining clones, just be aware of the overall structure of the manifold you’re trying to create. 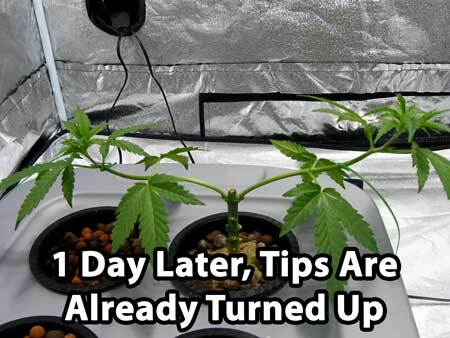 Don’t follow these step-by-step instructions for clones since this tutorial wase designed for main-lining cannabis grown from seed, but use your judgement to try to create a plant with as similar a structure as possible. Indoor main-lining seems to get the best results under powerful lights that have deep penetration. 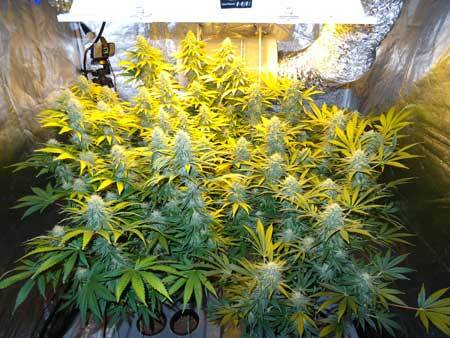 With main-lining, you grow long thick colas, and you need a powerful light to fill those colas up with bud. Because lights like CFLs & fluorescent grow lights don’t have much penetration, they aren’t recommended for main-lining. 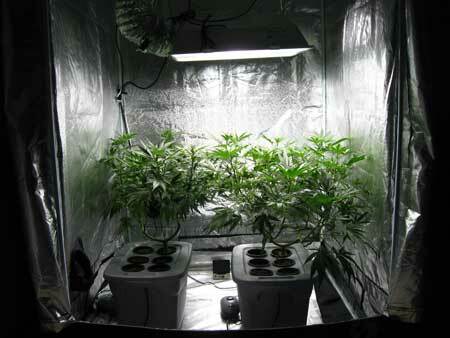 Main-lining performs best with MH/HPS grow lights or LED grow lights with 3W chips or greater. These lights have deep enough penetration to fill the long colas with bud, so they work well with manifolding. 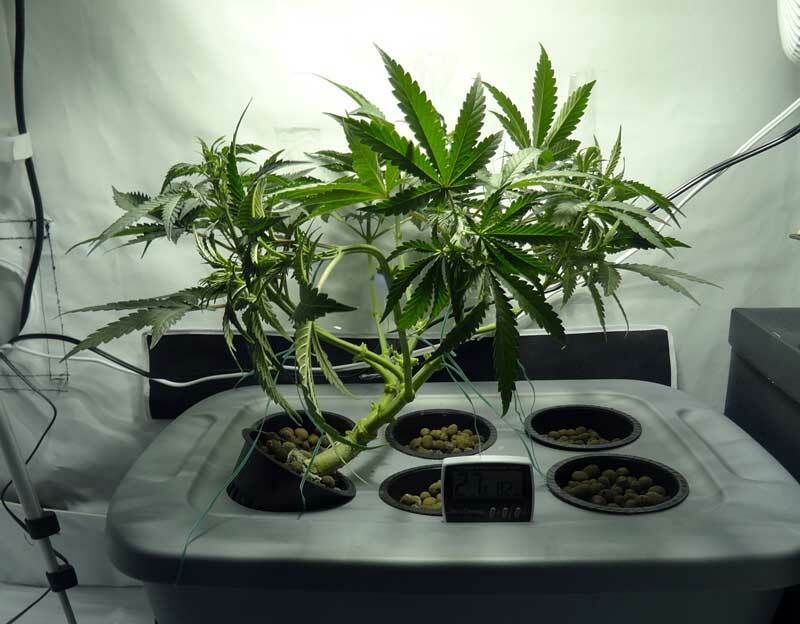 With CFL or fluorescent grow lights, standard training like FIMing or Topping will be just as effective as manifolding at increasing yields, but will take less vegetative time. Plant Training Tutorial – LST and Topping Technique! When topping, leave a little part of the old stem above the topping point. This helps reinforce the manifold and prevent any main stems from splitting as they are thickened through the manifold process. I know this may be hard for those who want to make everything completely even and neat. 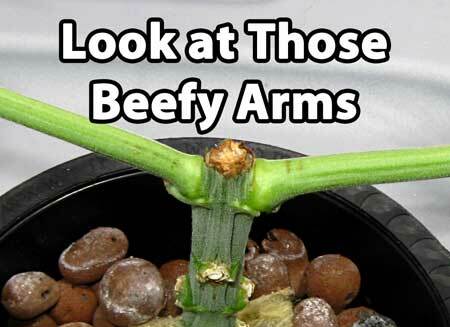 But leaving a little extra stem will help prevent your “elbows” from splitting. After the colas are well formed and you have a thick stem and manifold, you’ll be able to see the little mini stems (they won’t have grown at all, while the colas would have thickened coniderably). If they bug you, you can cut them off then. I just leave them on until the end. Main-lining works very well when mixed with LST (low stress training – gentle bending) to hold down plants in the spaces you want. Just remember that after you tie down a part of the plant, it will immediately start turning up and towards the light. If plants ever get an open wound or split any part of their stems, make sure to reinforce the injury (if needed) and immediately wrap with electrical tape, duct tape or even scotch tape. The leaves on the damaged stem may wilt, but if you secure the injury fast enough, the life will come back to the leaves. When using this technique, always make sure you check on the injury regularly to make sure the tape isn’t choking the stem. You will need to use a few different tools to secure down your plants at various phases of the manifolding process. These are the tools that have worked best for us. You can use whatever you’d like, but I do warn you not to use anything sharp (like string or thread) as it can start cutting into your plants once they start getting bigger and fighting back. The tools listed below will never run into that problem since they were explicitly made for training plants. Where to Tie… You can tie your new tops down to anything handy – the sides of your container, net pots, etc. 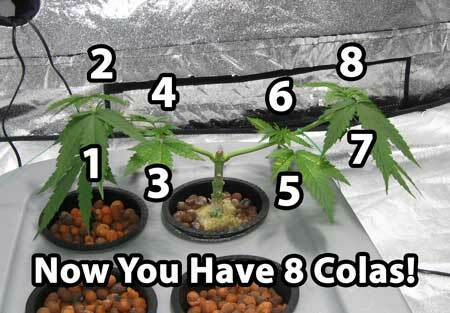 Just make sure that you’re tying your colas to something that moves with the plant. You don’t want to tie to a nearby object, use weights on the ground, etc. When you move the plant for whatever reason, you want the ties to move with the plant. This prevents accidental cola breakage. 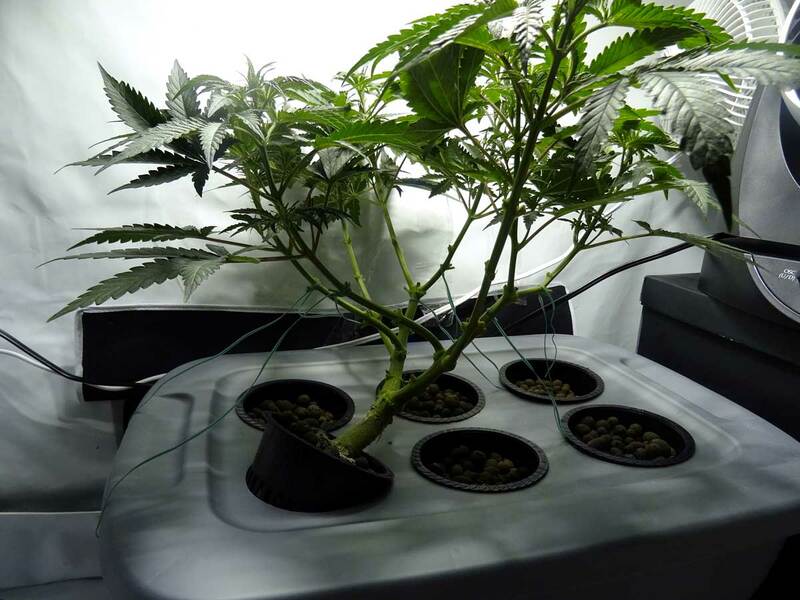 Growers almost always end up needing to move their plants for one reason or another during a grow, and it’s just a good practice to make sure the plant and container is self-contained and can be moved without disturbing the LST you are doing..
What Are the Best Ties to Use? 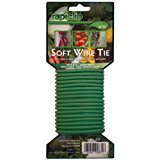 I like using a mix of “plant ties” and “soft wire ties” which are both made for gardening and are more gentle on the plant than string. I recommend using both. 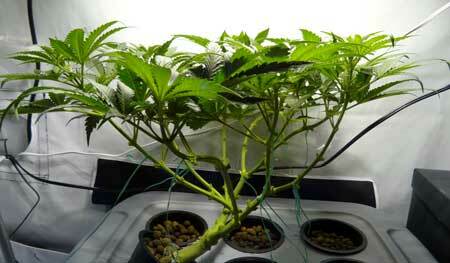 The plant ties are good for young plants, and soft wire ties are better for larger plants with strong stems. Now that you’ve got an idea of what tools you can use to secure your plants in the shape you want, let me walk you through everything. This plant was secured with plant ties, which were hooked to the edges of the container. In the beginning I use plant ties. The plant ties are very gentle on young stems & they can be easily molded into any shape, allowing you to create hooks to gently move young stems where you want them. Once you build your manifold, you won’t need these first ties, and they’ll naturally fall off. When the plant is responding to training by growing up at the tips, that’s a sign that the main-lining is going well. The growth tips of a healthy plant grow upwards and towards the light. At this point, you may start noticing that the base of your two main colas are starting to “beef up” as the plant sends ALL its resources to just those two stems. The plant is strengthening the connections between the main stem and the new colas, which causes bulging at the base of the colas. Plant ties are made of thin wire with a plastic coating on the outside. This material usually comes in a long spool so you can cut off as much as you need at a time. The container usually has a built-in cutter so you can quickly get a piece without any other equipment. 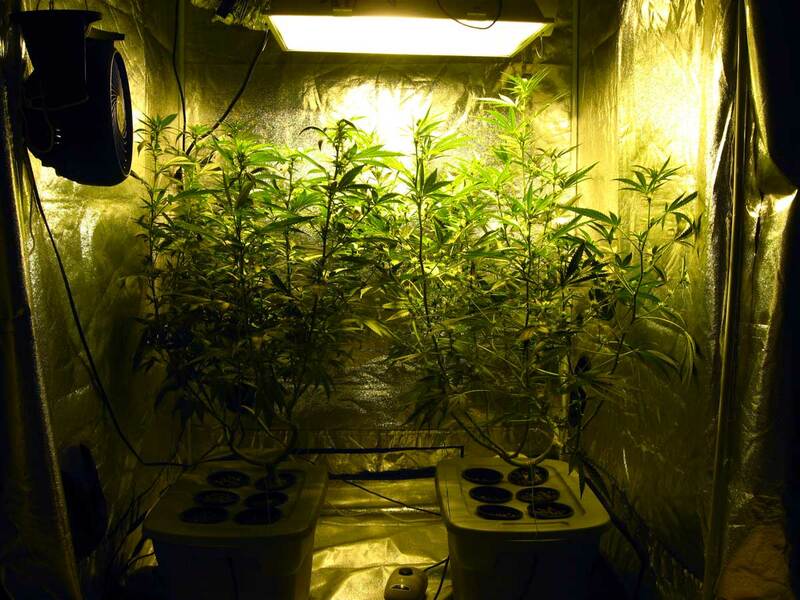 They tend to be more flimsy than some of the other methods to secure plants – they don’t have a lot of strength. But this is part of what makes them so great – they are very gentle on young plants. These can be hung conveniently to the top of your grow tent, and the special hooks at the bottom are idea to hold onto thick colas without causing any damage to your buds. When colas start getting too big to hold themselves up, plant yoyos will help you greatly. With this technique, the plant will produce these long dense colas that start falling over under their own weight and are hard to secure with other methods. 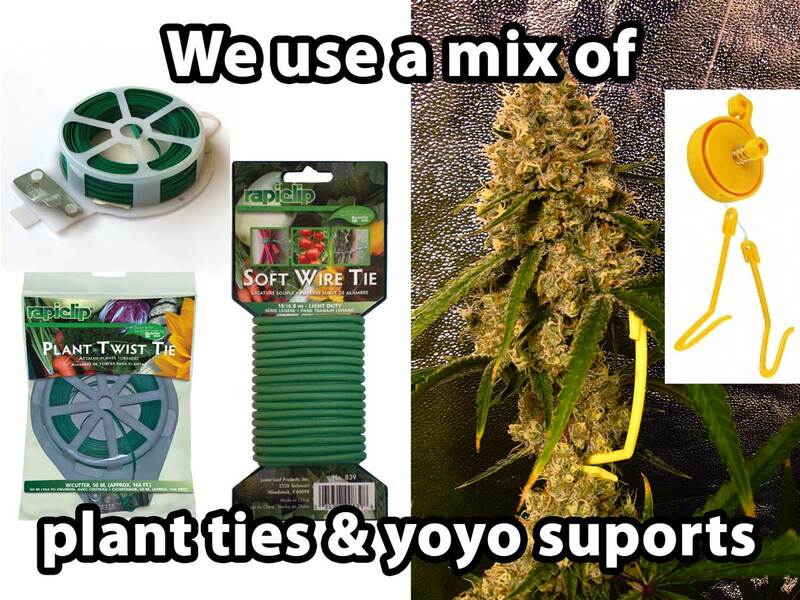 Plant yo-yos are perfect for gently stringing up colas where you want without damaging buds. In order to use plant yo-yos, you need something to attach to at the top of the grow space (easy with a grow tent, but may need some creativity in other grow spaces). Ready to start training your plant? After topping your plant, you use LST (low stress training) to hold the new colas down to make a relatively straight line. LST basically means gently bending your plants to do what you want. Bending the new colas down keeps the manifold short without much effort, and helps with the whole process of getting the plant to produce a great manifold. Basically, you’re just bending the colas down and away from the center of the plant, and then securing them so they grow in that position. Help Out Other Growers by Answering 6 Questions About Main-Lining Cannabis – You’re welcome to answer the questions even if you’ve never tried main-lining! This cannabis main-lining tutorial is a work in progress! I (Nebula) did not create “main-lining” and am not the first grower to try main-lining cannabis. Several marijuana growers asked me to put together a main-lining tutorial based on what I’ve learned so far in my setup, so I am sharing my experiences and personal technique for making a cannabis manifold. I hope this information helps other growers! The technique of “main-lining” or manifolding cannabis was first described and named by a talented grower known as Nugbuckets. Main-Lining (building a manifold) for growing cannabis is a relatively new technique on the grow scene. At least, it’s only recently that cannabis growers have been talking about it by the name “main-lining” or “manifolding.” Chances are growers have been using similar techniques for decades, but only now has it come to be described by this name. In Nebula’s cannabis manifold tutorial above, she does things just a little bit differently to save time in the vegetative stage, yet while being able to still accomplish the same results as far as increasing bud size and yields!